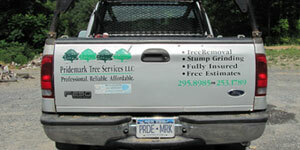 Pridemark Tree Services proudly serves Albany with quality work, quick response and reasonable rates. We specialize in Tree Removal, Tree Trimming, Stump Grinding, Brush Clearing, Land Clearing, Tree Pruning, Hedge Trimming, and Gutter Cleaning. We also offer crane service, bucket truck service, technical rigging and climbing. In addition, during the winter, we can clear ice dams and snow from roofs/decks/etc. We are a practical company that treats people right (the way we would want to be treated). We build customer relationships for the long term. Our company returns all phone calls, shows up when supposed to and stays in good communication with customers. Pridemark is fully insured, including workers compensation and we offer proof of such by way of a personalized insurance certificate before we begin the job. Most of our business is through referrals and we want to continue that trend. We want you to be completely satisfied and if you are, please pass on our name to your friends. Strom Damage? In the event that a destructive storm hits your neighborhood, don't let finding a tree service company add to your already stressful situation. Keep us in mind if that time ever comes. Our region has seen its fair share of damaging storms. And when that big storm hits again, keep our contact information on hand. We are just a phone call away from getting your property cleaned up. Contact Info Be safe and call in the professionals. Let our skilled crew do the work. There may be dangers you can't anticipate. We can take care of most emergency tree service within 24 hours. Email us for our business card to keep on hand or just add us to your smart phone. Pridemark Tree Services is a family owned and operated company. The owner is Stephen Francis. Steve grew up on an Albany County dairy farm and learned the value of hard work and work ethic at a young age. He started out cutting and selling firewood from his Dad's farm at the age of 13. Then a few years later, while in College, he began tree removal and related work on a part time basis. After graduating from SUNY at Oneonta with a B.S. in Business and Economics, he went to work for the State of New York for 15 years. All that time, Steve continued working in the tree care industry "part time" at an increasing rate. Then he finally jumped into tree work full time in April of 2008 when he opened his second company "Pridemark Tree Services". Steve is a family man who enjoys spending time with his wife and three children when he is not working. His other passion is going on short-term mission trips to places like Africa, South America etc... where he can help some less fortunate people in the world. With over 20 years of experience, we are Albany County's premier tree services company. We don't expect your trust, we earn it. Call us today or visit our contact page to send an email for a free, no hassle estimate.